ST. GEORGE — Staging the St. George Marathon wouldn’t be possible without the help of volunteers, organizers say. From stuffing race bags with coupons and Clif bars to handing out water, Gatorade and fruit at aid stations on race day, volunteers fill many key roles. Ellsworth said hundreds of volunteers are expected to help out with the race this week, including as many as 1,500 on Saturday alone. More than 1,200 people have already officially registered as volunteers for the 2017 event, according to Kendra McArthur, the race’s volunteer coordinator. More are still needed, she said. “We have many areas that could still use some volunteers,” McArthur said, adding those interested can click on the volunteer link at the marathon’s website to see a list of areas that still need more help. “They help anywhere from stuffing runner bags during the week, pasta dinner, helping at the expo Friday night, aid stations, trash, massages, catching runners as they finish, medals, finish-line food, clothing retrieval and the list goes on,” McArthur said. Volunteers range from seasoned veterans to first-timers. 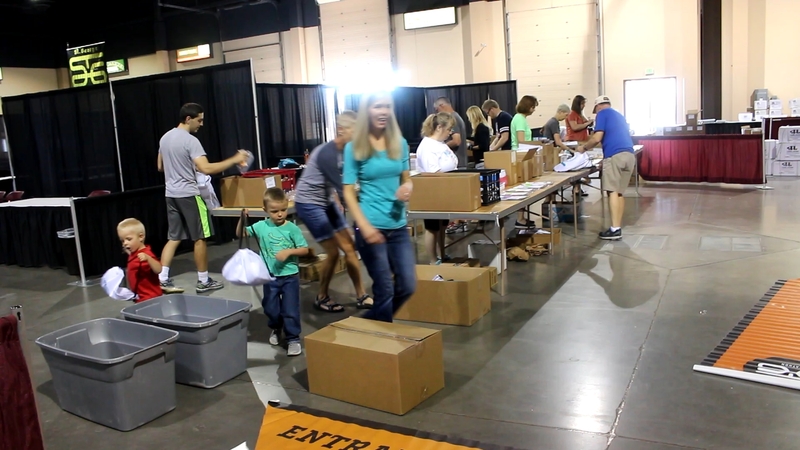 Among those stuffing freebies, schedules, coupons and promotional items into race bags Wednesday morning was St. George native Amber Green, a three-time winner of the St. George Marathon who took first place in the overall female category in 2012, 2014, and 2015. 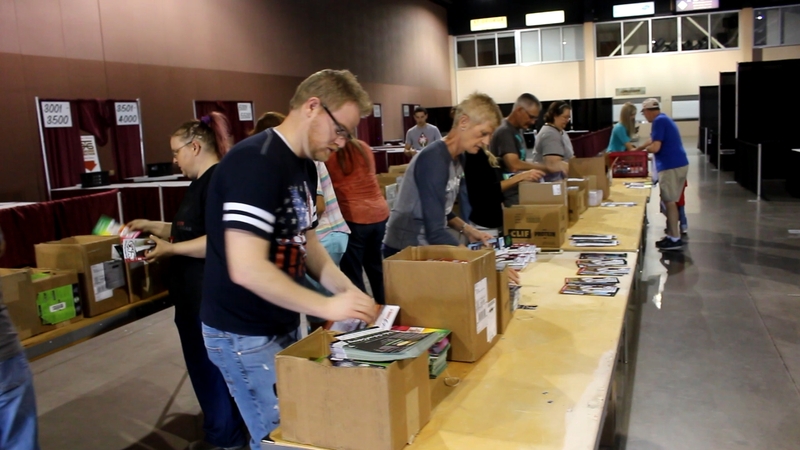 “This is the first year that I’ve volunteered with packet stuffing,” Green said, adding that putting more than 7,000 race bags together in two days is a daunting task for the two dozen or so volunteers who share that assignment. Standing next to Green in the packet-making assembly line Wednesday morning was Terry Tucker, a 25-time runner of the St. George Marathon who is helping as a volunteer for the 33rd year. In addition to putting race bags together most years, Tucker said he has pitched in to help in several other areas, including runner support, information booth and helping certify the course. “We keep hearing of people who come to the marathon and then have so much fun with it, they end up moving here,” Tucker said. His wife, Karen Tucker, who was also busy putting packets together Wednesday morning, said she has also been helping with lead runner support, personally contacting the race’s top registrants in advance of the race. “It’s a lot of fun to be behind the scenes,” Karen Tucker said. The Tuckers are among those scheduled to be inducted into the race’s prestigious Road of Fame this year. The induction ceremony will be Friday at 1:30 p.m. during the day-long expo at the Dixie Center St. George, 1835 S. Convention Center Drive, St. George. Just a suggestion, but would it be asking too much to give credit to the person who originated, developed and managed the very first marathon in St George? Would it help to know that he continued to encourage runners and plead for community (including the politicians) support for it? And would you like to know the name of this crusader? Robert Horlacher, athletic coach at Dixie State College,who, along with Sherm Miller, started the first marathon 9n 1971 with 55 runners registered that first year. He earned the title of the “father of the St George Marathon”, he deserves to be recognized. Mesaman, thanks for your comment. I have passed this along to our reporter covering the marathon, both preview and post coverage. I agree that it is worth mentioning.